This review was published on June 18, 2009. Since then, this product may have been discontinued or replaced. Pricing and availability may differ from what is stated in the review. This one is a difficult call as both televisions force you to make compromises. The JVC LT-42P300 offers a built-in iPod/iPhone dock that many will find useful. It also does a significantly better job with color reproduction and equivalent motion performance, which isn't good. The Toshiba, however, is $250 less and offers much better black/white performance. This one really comes down to whether that integrated dock is important to you. If not we'd go with the Toshiba, if it is we'd go with the JVC. The Toshiba Regza 40XV645U significantly outperforms the JVC LT-42P300 in this area, with much deeper blacks, although the peak brightness is about the same. 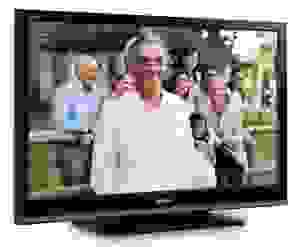 Those deep blacks have a huge impact on total contrast ratio, however, with the 40XV645U sporting a contrast ratio almost seven times that of the JVC model. The JVC LT-42P300 does a significantly better job reproducing colors. The color temperature is much more stable and the color gamut adheres more closely to the international standard. It also does a slightly better job producing accurate reds, greens and blues, so it's just better across the board than the Toshiba Regza 40XV645U. Even though the Toshiba Regza 40XV645U sports a 120Hz refresh rate that the JVC model lacks, the motion performance is actually pretty similar. The JVC LT-42P300 is the clear winner here, with a wider viewing angle. It also does a significantly better job diffusing light on the display. Both televisions offer 3 HDMI inputs and a rough equivalence in other ports, including a USB port that supports only photo playback. The JVC LT-32P300 takes a big step over the Toshiba Regza 40XV645U by offering an integrated iPod dock, however. This allows you to play music and videos stored on an iPod or iPhone with a nice interface controlled by your remote. The JVC LT-42P300 offers slightly better audio quality from the built-in speakers than the Toshiba Regza 40XV645U.